This is a hard post for me to write... in the literal sense because I'm using my phone, since our internet won't be hooked up until monday, and in the emotional sense because of the content. On Wednesday I had to take Lloyd to the vet. After a few weeks of finicky eating and a few odd episodes in relation to food, he hadn't eaten in just over 24 hours, so Shawn and I realized it was time to get him checked out. The vet found his back molars and throat to be severely infected by gingivitis. This happened about a year and a half ago too, but the infection was much less severe then and we were able to treat it and got him back to healthy in no time. This time, the vet gave us some medicine for the pain, and medicine to treat the infection, but she also told us that in order to clear up the problem and hopefully keep it from reoccurring, Lloyd needs dental surgery to remove his molars. We pretty much expected as such, but we did not anticipate the cost of the surgery... she quoted us $2000 because they charge by the hour and it's an intense surgery. Shawn and I clearly really love the little guy, but seeing as we both work in the restaurant industry, there is absolutely no way we can afford that surgery. But we also can't bear the thought of him being in pain or, well, you know... the other option that inevitably comes from a cat that refuses to eat. That dollar amount is a high estimate- I'm actually going to call other vets today and see what the range of cost is for said surgery, and hopefully we can get him in somewhere this weekend. 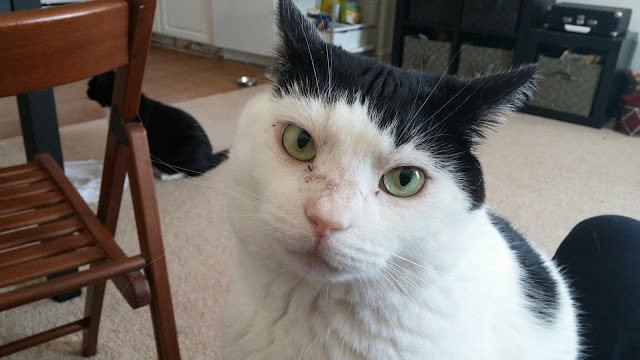 Because the internet had everything to do with Lloyd's initial entry into our lives, and we aren't ready to lose him any time soon, I thought it wouldn't hurt to reach out to the internet again and ask you all for help. I created a GoFundMe page for him and reached out to friends and family to help share it. Lloyd, Shawn, Sylvester, and I would be beyond grateful if you could share the link and/or donate to Lloyd's surgery fund. I reached out to Kaylah earlier today to share the link on her blog and I am insanely moved by the response and amount of money that has already been raised in less than 24 hours. Every amount helps- the way I see it, if we can get 50 people to donate $10, that's huge! Please help us help Lloyd! I really don't know what else to say except thank you, from the bottom of our hearts. The internet is truly an amazing place and I am so humbled by the generosity of strangers. I can't imagine what we would do without all of you! Please send love and healing energy Lloyd's way- he really needs it!